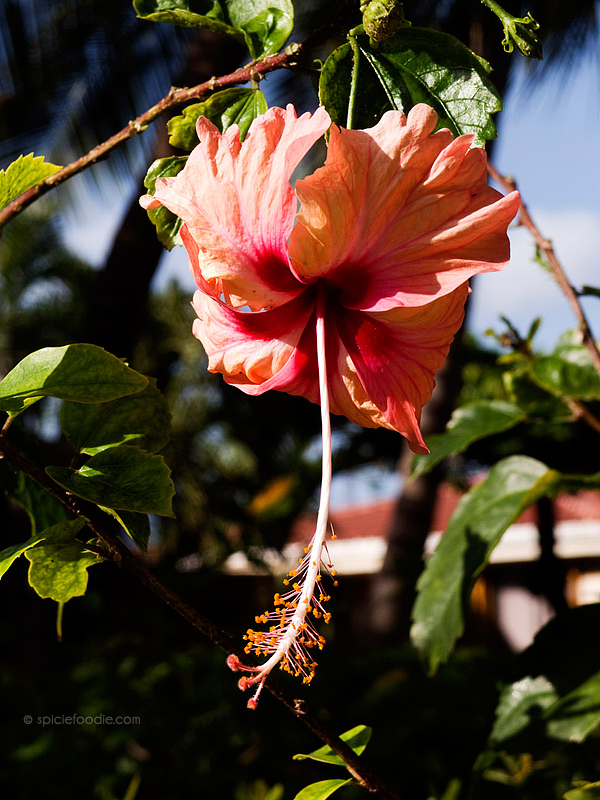 Belize is a small Central American country bordered in the north by Mexico, in the south and west by Guatemala and to the east by the Caribbean Sea. 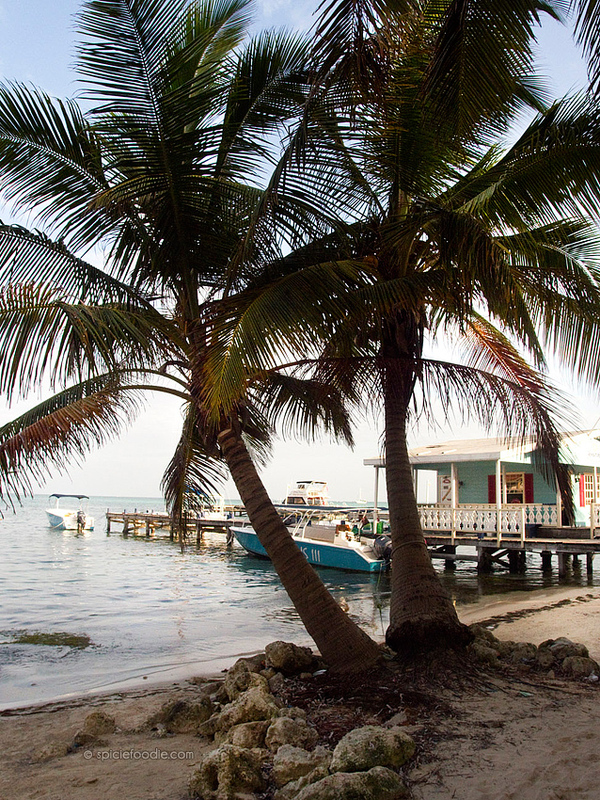 Belize’s territory consist of a mainland and over 450 islands; The two most populated islands being Ambergris Caye and Caye Caulker. 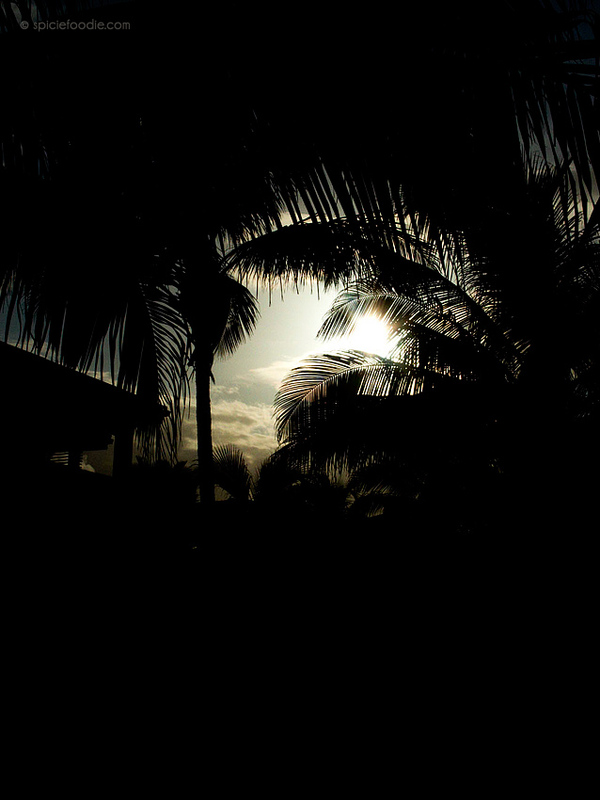 We recently went on a small getaway to the island of Ambergris Caye and today I’d like to share with you pictures (or part one) of our mini tropical getaway. 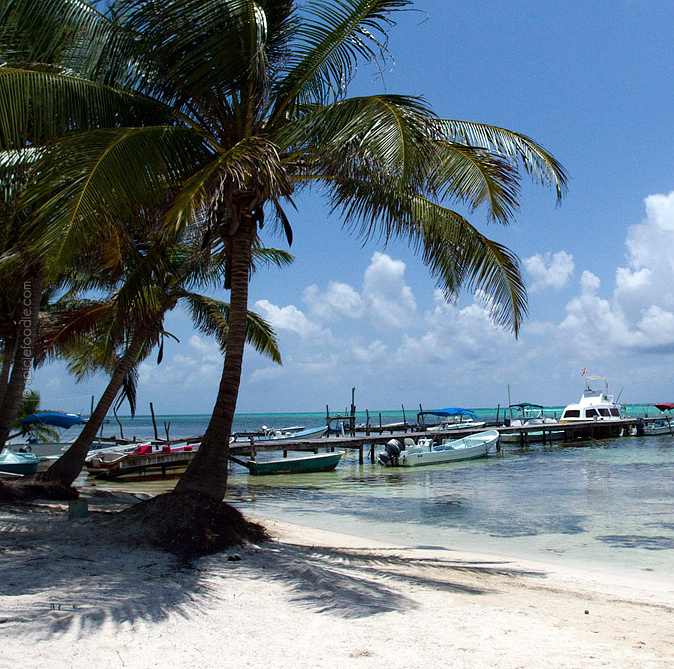 There are a couple of ways to get to Ambergris Caye: Via airplane (more like puddle hoppers) from Belize City and right across the Mexican border in the Belizean city of Corozal. 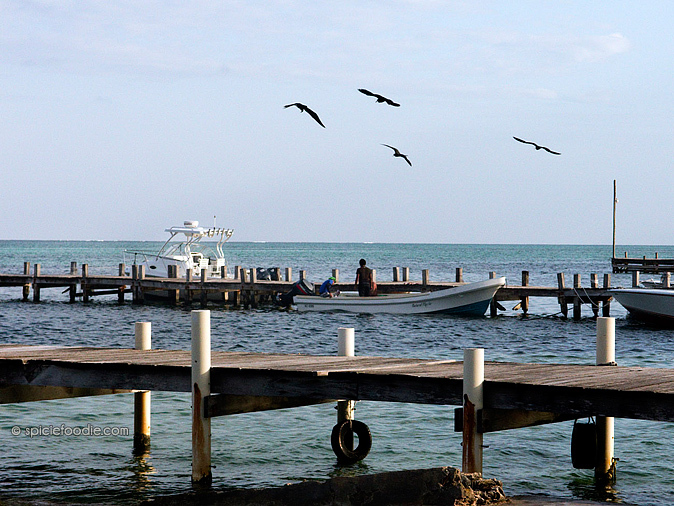 Additionally you can arrive via water taxi from Belize City or border town of Chetumal, Mexico. We choose the more adventurous mode of transportation of the water taxi because I’ve never taken one and really wanted to experience it. 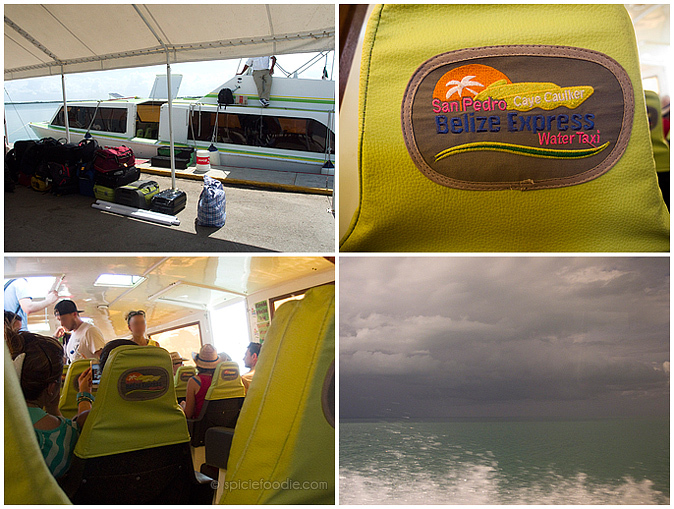 (There are two water taxi operators, San Pedro Water Jets Express and Belize Express Water Taxi) To get to the water taxi we first had to take the ADO bus from Playa del Carmen to Chetumal. Now don’t get those horrible Hollywood images of bus travel through Latin American. The ADO buses are very comfortable — in fact they have more leg room than flying coach. The buses are air conditioned, have reclining seats, have clean toilets, and movies are played during the trip. (I’ll tell you more about ADO another time.) Even though I’m Mexican I’ve traveled very little in my country. For me it was interesting seeing this side of the country and how the small Mayan villages differed than the ones where my family is from. The hours passed quickly and uneventfully on the bus. We arrived to Chetumal and took a 10 minute taxi ride to the “Muelle Municipal” or city’s pier where the Belize water taxis departs from. Having some time to kill we wondered along the water’s edge. 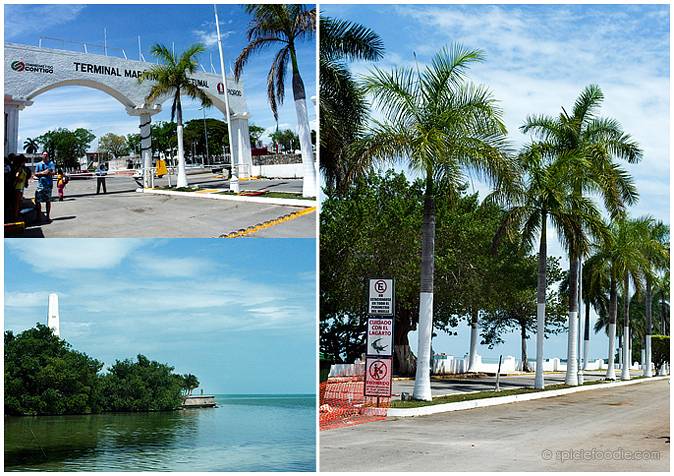 Chetumal is on a beautiful and calm bay that is home to manatees, crocodiles and much more sea and wild life. 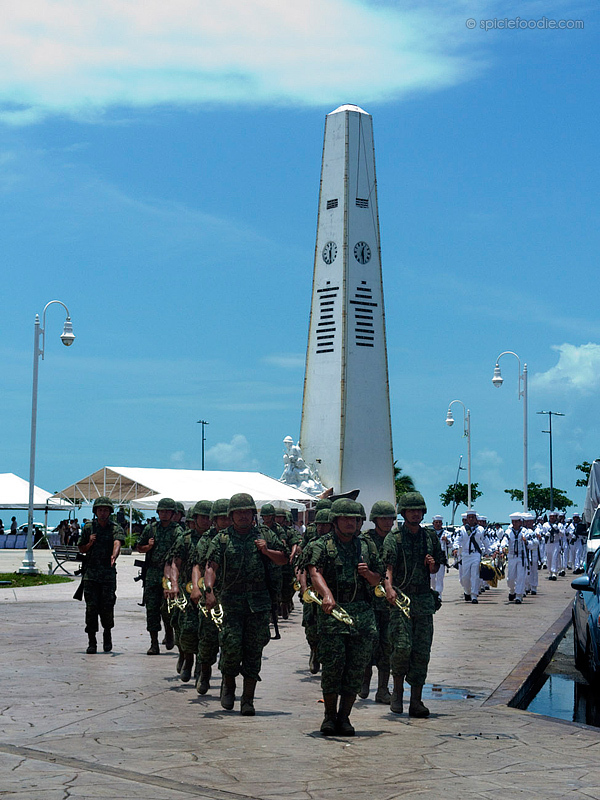 We were hoping to spot either a manatee or crocodiles but sadly we didn’t, however we did come across a military parade that was impressive to watch (read lots of hot guys in uniforms…). The process of checking into the water taxi is pretty straightforward: Walk into their office right next to the city’s dock gate. I would suggest you purchase your water taxi tickets before arriving because there is only one 3:30 pm departure a day from Chetumal. The two companies trade off but the tickets are accepted by both of them. The friendly staff will check your ticket, your baggage and direct you were to go. Next you’ll line up to wait for outgoing Mexican immigration, this too is very easy. You wait in line then walk into the tiny office where two friendly Mexican immigration officers will ask you a couple of questions about your travel then give you an exit visa stamp. There is also an exit/port fee that you’ll have to pay. It isn’t very much and I highly suggest you not waste your time trying to argue it or get out of paying it — it’s not worth it, it’s the law and so do yourself a favor and pay the small fee. After the painless check-in and immigration control you wait for the water taxi staff to walk you down the pier to board the boat. I was in awe watching the staff load the boat with so much luggage, I really thought they wouldn’t be able to fit it all in. Thankfully we packed light and our bags went right under our seats on the boat. As someone who isn’t 100% percent comfortable with the sea I was a bit nervous about the boat ride. Though I had read that the trip was a smooth one, I still took some dramamine beforehand — nothing worse then traveling and arriving in a new place with nausea. 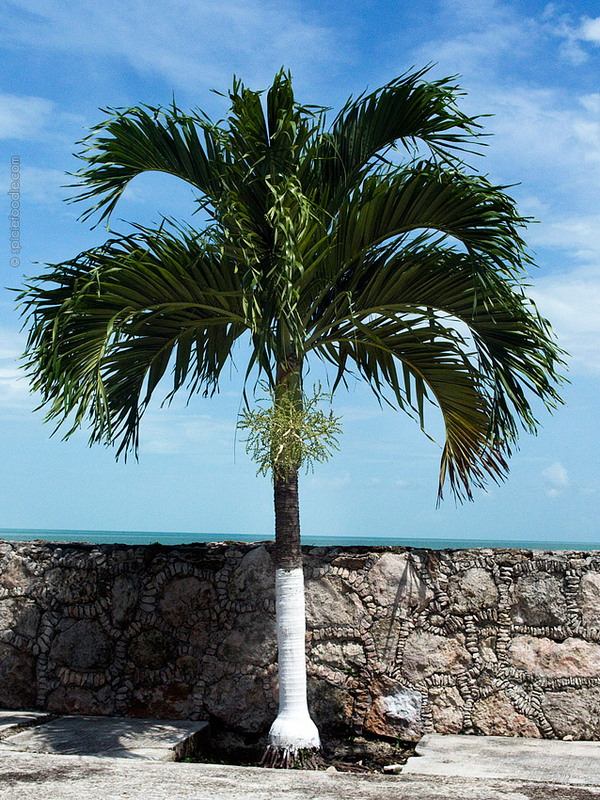 The day we traveled was a beautiful sunny one and the water on the Bahia de Chetumal was completely still. I took the small steps to walk into the boat. Inside were what I estimate to be 60 seats, there was also a bathroom in the back. The staff hands out Belize immigration forms that will be needed upon arriving in San Pedro, the town were we were arriving in Ambergris Caye. After luggage was loaded and the passengers in their seat, we got underway. The excitement and slight nerves set in. The boat pulled away from the port and off into the bay we went. The water taxi begins picking up speed and goes faster and faster until it reaches its top speed. These boats are very fast and need to be in order to cover the huge distance in only 2 hours. 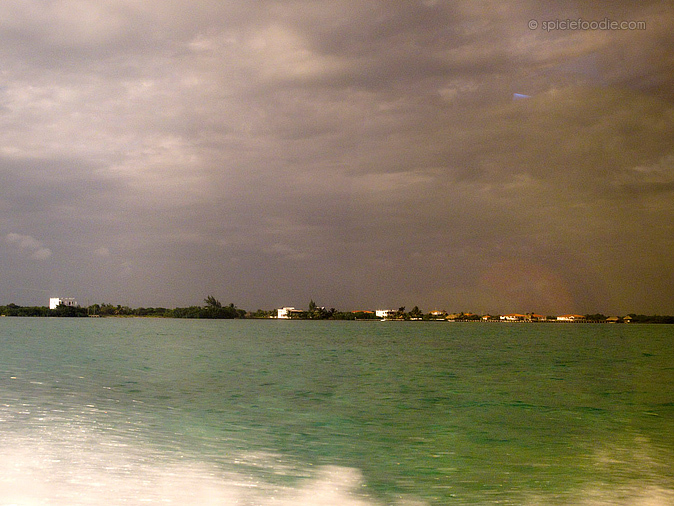 My nerves quickly disappeared as we sped off towards Belize. Even through the brown coating on the windows I could see the most magnificent views of the shoreline and the bay. I kid you not it felt like being dropped into the most gorgeous painting you’ve ever seen of the Caribbean. Off in the distance you could see mangroves, now and then a tiny island with one tree would pop up, then you could make out small villages. Far off in the distance was a rainstorm creating dramatic skies. The ride was as smooth as a boat ride can be. We sat way in the back because on a super fast boat like this one, this is were you’ll feel the bumps the least. While many passengers slept, I so loved looking out the window watching the water spray by and the tiny waves lapping in the distance. As I munched on the cookies and water snack handed out by the staff, my whole body felt so much joy. The Caribbean breeze coming in through the windows, my husband by my side, and the spectacular views got our trip off to a fantastic start. I love visiting new places. For me the trip went by relatively fast, and best of all I did not feel motion sickness at all. Yay! 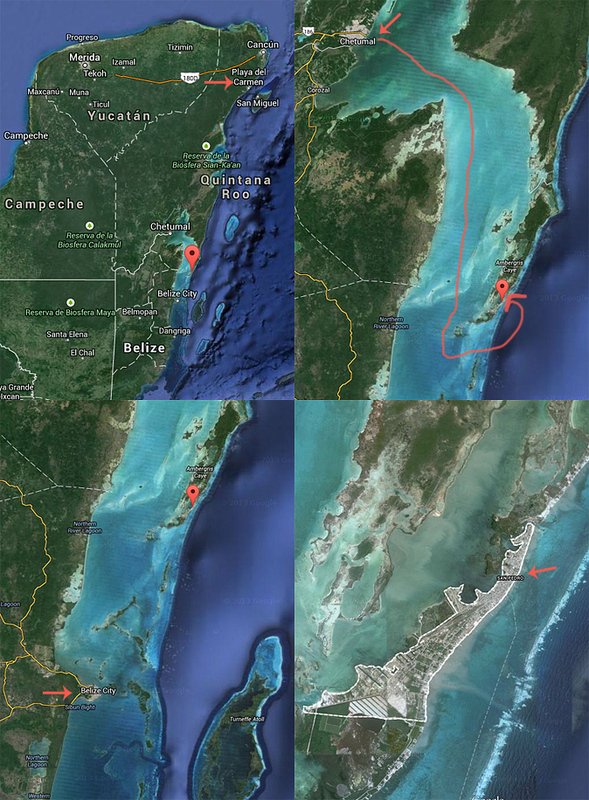 As we were getting closer to San Pedro more and more settlements appeared on the shoreline. We slowed down and there we were, right in the heart of San Pedro. 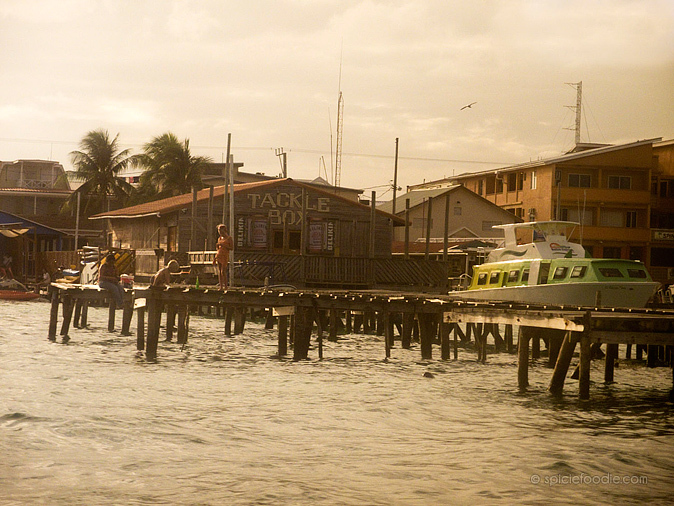 Right as we were pulling into the dock we saw such a Caribbean scene: Children with sun-kissed skin, salt water bleached hair, and light summer clothes fishing right off of the rustic pier. Right before disembarking I took one last look out the window and saw a couple of stingrays swim by. Now it’s time to line up for Belizean immigration. The officers are inside a structure right on the pier. You hand them your passport and customs forms, they quickly look over it and your passport is stamped with an entry visa. This took no time and was super easy. Our hotel was right down the beach from the water taxi pier. We took our shoes off and barefoot walked the 7 minutes (or so) along the beach/road to our hotel. 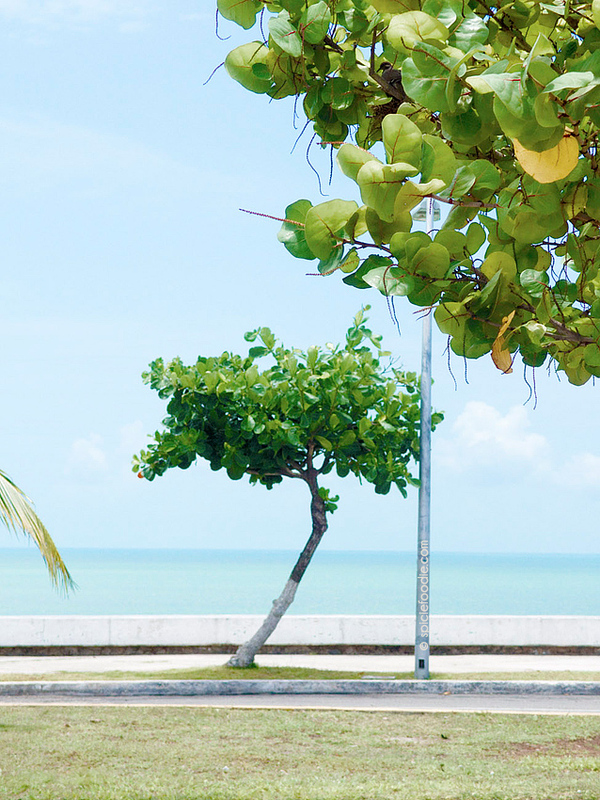 Along the way we came across tons of palm trees, many piers, restaurants and hotels, and friendly locals greeting us with a hello or a good afternoon. Even the children playing in the water and the water’s edge all stopped to greet passersby. Representing the true melange of Belizean cultures was every shade of skin colour and multiple ethnic groups. 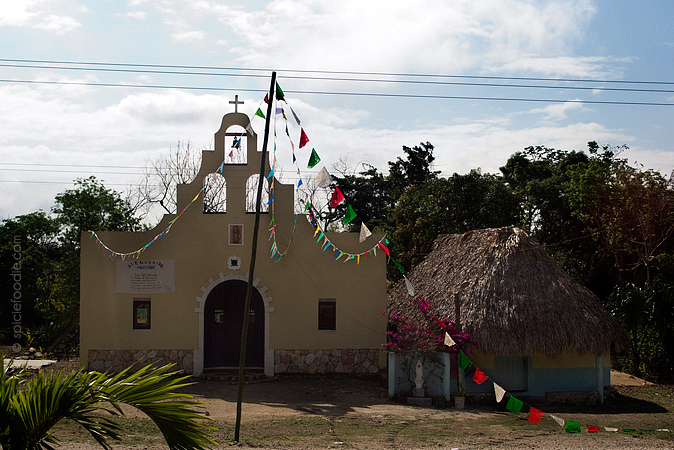 English is the official language in this country, but Spanish, Kriol and Mayan dialects are also spoken here. First impressions were great. After checking into our hotel and cleaning up we went for another walk along the premises and the beach. The hotel’s grounds were absolutely gorgeous and meticulously kept. I loved that the rooms all lead right into a sandy courtyard surrounded by palm trees and tropical plants. You could hear the tropical birds calling out to each other. 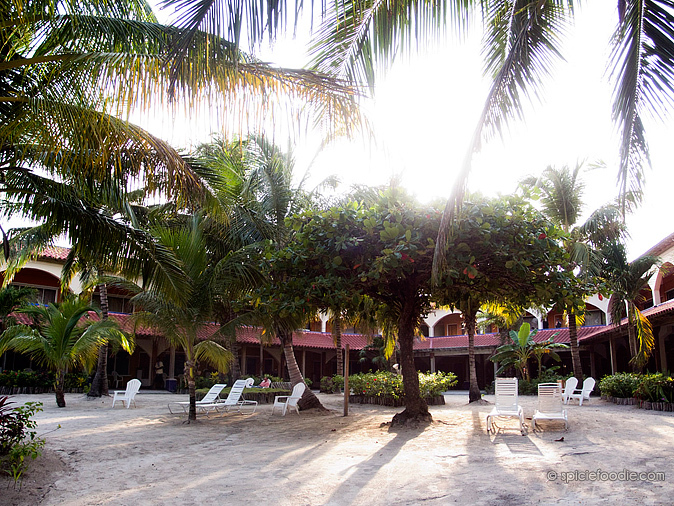 There was a beautiful pool, hammocks here and there and lounging chairs with views of the Caribbean Sea. We walked down the beach and onto one of the many small piers. 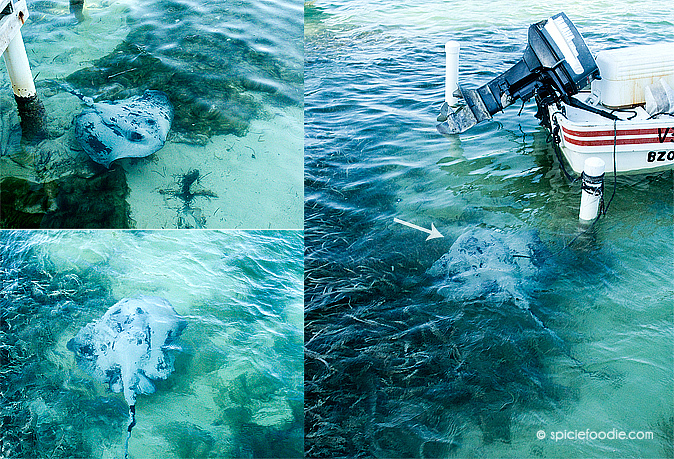 Again we spotted many fish and the sting ray in these pictures. By now the sun was getting lower in the sky and the colours were a golden hue. Off we went to have a bite to eat. 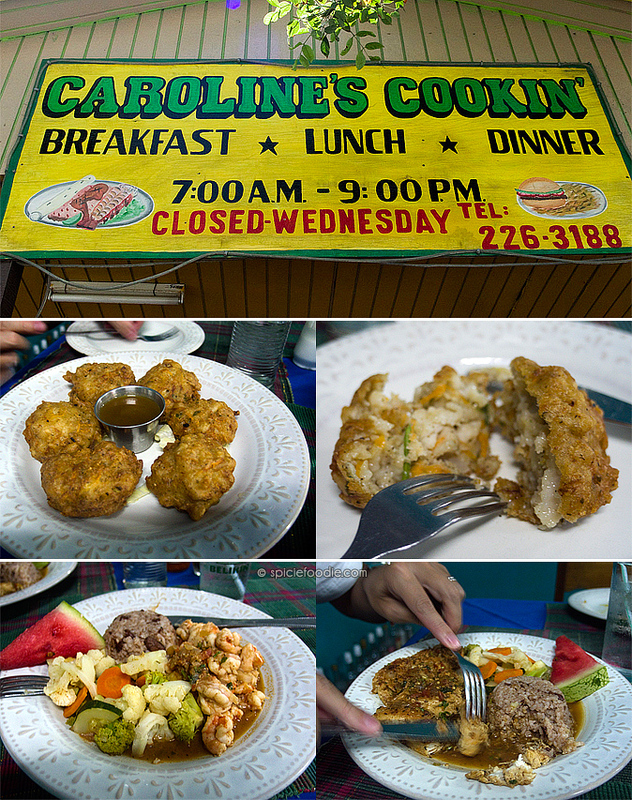 On the recommendation of the super friendly hotel staff we went to a small restaurant called Caroline’s Cookin’ right in front of the island’s airstrip. As an appetiser we ordered the conch fritters — one of my favourite Caribbean foods that I haven’t been able to eat in many years. For our main dish I ordered jerk shrimp and my husband ordered jerk chicken (he still occasionally eats meat). 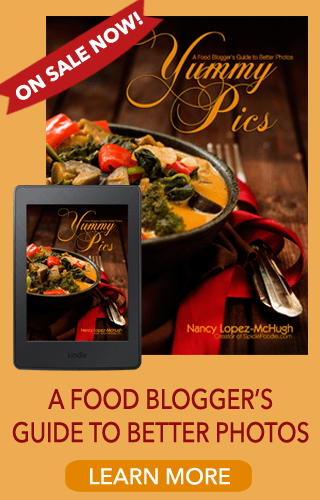 The food was among the very best we’ve ever had! We loved the restaurant and absolutely adore the owner, Caroline, so much that I’m dedicating a full piece to Caroline’s Cookin’. Look for it soon. 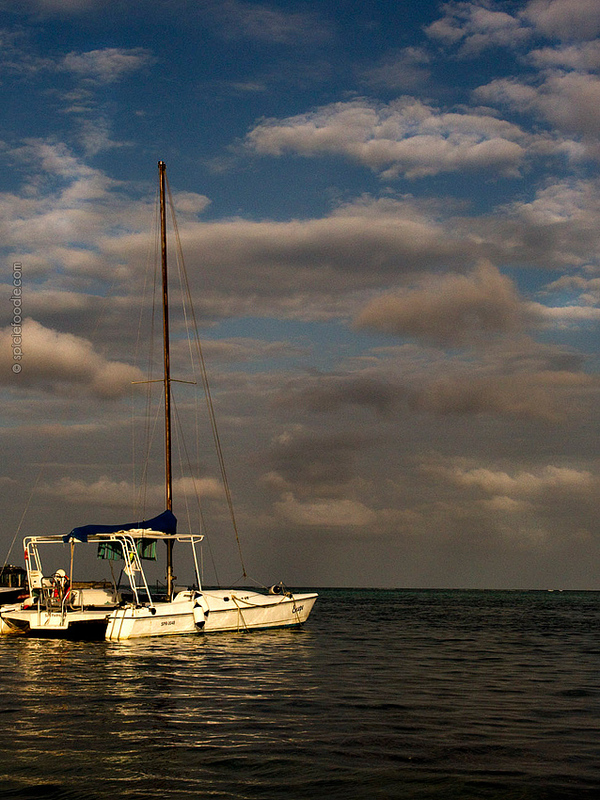 For now I hope you enjoyed this first part of our getaway to San Pedro in Ambergris Caye, Belize. There are many more pictures to come. What a lovely place and gorgeous beaches. 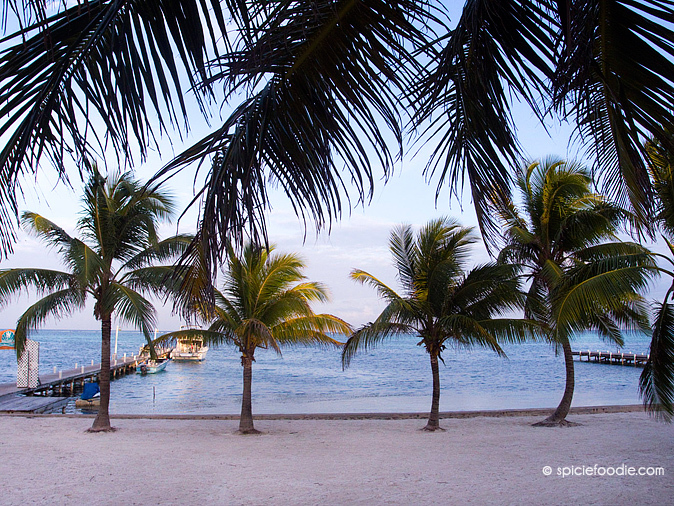 Wasn’t very familiar with Belize but it has beautiful sights, thanks for sharing. I’ve heard of Belize but this is the first time I’ve seen pictures. Adding it to the list of places I want to experience. What a beautiful place to vacation!